A Literary Odyssey: Carrie Ryan Giveaway Winners! I just figured out who the winners are for my Carrie Ryan Giveaway! 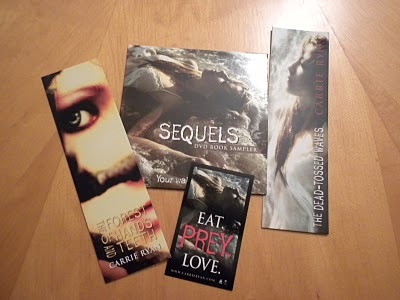 For full details about the contest, click here to read about the great signing I went to! 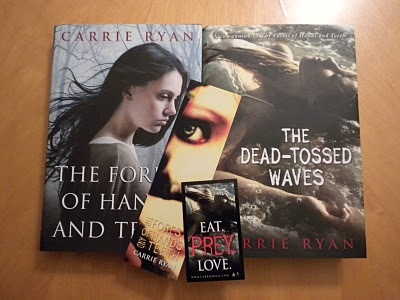 If you don't remember, first place is winning the following: Hardcover copy of The Forest of Hands and Teeth (signed), Hardcover copy of The Dead-Tossed Waves (signed), The Forest of Hands and Teeth bookmark, and an "Eat. Prey. Love." sticker. And second place is winning the following items: The Forest of Hands and Teeth bookmark, The Dead-Tossed Waves bookmark, "Eat. Prey. Love." sticker, and CD full of videos and information about The Dead-Tossed Waves and other YA novels and sequels. Lydia from The Lost Entwife! Lauren from Lauren's Crammed Bookshelf! I will be contacting you both via e-mail. Please get back to me in the next 48 hours or I will have to pick another winner!